The Al-Maktoum College of Higher Education community fund has donated £5,000 to Dundee schools involved in the Anne Frank Trust UK Schools Programme. The donation from the Shaikh Hamdan Community Sponsorship Fund, managed by the College, will help a group of 28 pupils from the city to visit Anne Frank’s house next month (June 16) in Amsterdam, where the 13-year-old Jewish teenager and her family hid from the Nazis for over two years from June 1942. Around 150 second-year pupils from five Dundee secondary schools – Grove Academy, Morgan Academy, Harris Academy, St John’s High and Menzieshill High – took part in the programme as peer guides to a visiting exhibition and shared the story of Anne’s life with more than 2,000 other pupils. Six pupils from each school have received further training as Anne Frank Ambassadors, developing workshops to deliver to younger pupils. And this week (May 19), six from Harris Academy and St John’s High – were at the Al-Maktoum College with their teachers to give a presentation. “We have been very impressed by the excellent work undertaken by the pupils at the schools involved in the Anne Frank programme and their exceptional presentation to us,” said Dr Hossein Godazgar, Principal and Vice- Chancellor of Al-Maktoum College. “We were really pleased to make the donation as the pupils’ programme reflects in many ways the College’s desire to try to build bridges between communities and peoples at all levels across the world through dialogue and intelligent debate. “We seek to promote at all times a greater understanding of different religions and cultures and to tackle any discrimination or conflict that occur in the names of religion, race, nationality and so on. “Multiculturalism is at the heart of our vision so the Anne Frank education programme matches our beliefs and efforts in its aims to challenge prejudice, reduce hatred and promote positive attitudes, respect and responsibility to others. Councillor Stewart Hunter, Dundee City Council convener of education, said: “We are grateful to the Al-Maktoum College of Higher Education community fund for this donation. “The work that has been undertaken by our pupils on the Anne Frank programme supports understanding and tolerance. 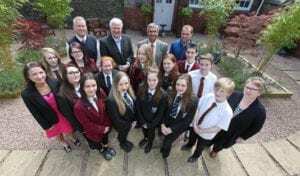 Heather Boyce of the Anne Frank Trust UK said: “This is the first sustained programme of work we have carried out in Dundee and I’ve been delighted with the interest and enthusiasm with which it has been greeted by pupils, staff and Dundee City Council. Established in 2009, the Shaikh Hamdan Community Sponsorship Fund helps many different organisations in a range of ways and has now donated more than £120,000 in support of community groups, mainly in the Dundee area. Anyone seeking support from the Community Fund should ideally make any applications to it through Foundation Scotland.